Legacy Recordings, the catalog division of Sony Music Entertainment, will release Nicky Holland’s Nobody’s Girl, available worldwide as a digital-only title, this Friday, July 28. Fans can pre-order Nobody’s Girl here, and will instantly receive the newly mixed version of “This Town.” Listen to “This Town (2017 Mix)” here. 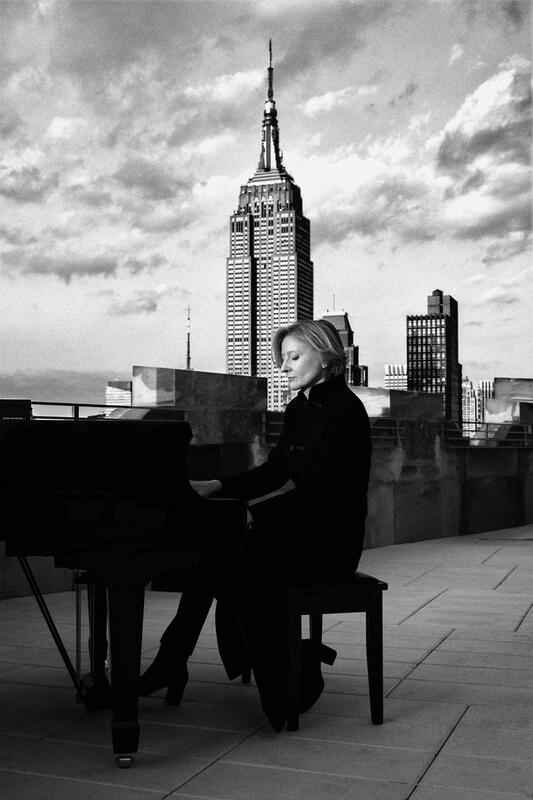 With 2016 having marked the 25th anniversary of Nicky Holland (her solo debut, released June 1991) and 2017 occasioning the 20th anniversary of Sense and Sensuality (released June 1997), singer/songwriter/pianist/composer/arranger Nicky Holland (whose resume includes Tears For Fears, Fun Boy Three and creating scores for John Hughes films) sensed that now was “an appropriate time to re-evaluate” those albums and assemble Nobody’s Girl, the definitive retrospective of her solo work as a recording artist for Epic Records. Lovingly curated and newly remixed by the artist, Nobody’s Girl brings together 13 essential studio performances–seven from Nicky Holland(produced by Derek Nakamoto and Nicky Holland), five from Sense and Sensuality (produced by Michael Beinhorn) and her unforgettable version of the Burt Bacharach-Hal David classic “I Just Don’t Know What To Do With Myself” (produced by Jimmy Bralower and Jeff Bova). Originally recorded for the multi-million selling “My Best Friend’s Wedding” soundtrack album (also released in June 1997), the track “was actually the last thing I did as a singer,” Nicky remembers. A big fan of Dusty Springfield’s iconic recording of the song, Nicky “was thrilled when Sony asked me to sing it for the soundtrack record.” Nicky Holland and Sense and Sensuality will also be available for the first time ever digitally on July 28th. Pre-order Nicky Holland here, and pre-order Sense and Sensuality here. Nobody’s Girl features the single mix of “Nobody’s Girl,” a song Nicky co-wrote with Lloyd Cole, and the single mix of “Tongue-Tied and Twisted,” which she co-wrote with Ellen Shipley. The album includes Nicky’s version of “Hat Full of Stars,” a song she co-penned with Cyndi Lauper (who made it the title track of her 1993 studio album). One of the highlights of Nobody’s Girl is “New York Inside My Head,” a song originally appearing on Sense and Sensuality for which Nicky has recently completed a breathtaking new video lensed by Karsten Staiger. NH: 2017 has been treating me extremely well. I’m working on a new project, Clementine, and I have old and new material being released, as both an artist and a songwriter. I have a new video for a song that is over 20 years old. It’s great when things finally start to move. NH: Today I am at home on Sullivans Island, SC. No, I’m writing in silence. I tend not to listen to any music when I’m working as I find it too distracting. Songs like Get What You Give by New Radicals, Jamming by Bob Marley and The Wailers,There She Goes by The La’s and This Will Be by Natalie Cole never fail to get me out of a bad mood. NH: I started writing songs when I was twelve, and this took up most of my spare time throughout my teens, other than my boyfriend! My earliest musical memory is dancing the hornpipe and being a butterfly alongside my sister, accompanied by my mother playing the piano. I was probably about 2. NH: At about 16, I considered being an actress for about 5 minutes, but music quickly nixed that idea. It wasn’t until I was about 40 that I realized I could see myself as a doctor. I always like to ask artists about where they came from and have that city or town has influenced them as an artist now. So how do you think your hometown has shaped who you are as a musician and the kind of music that you create? NH: I grew up in the English countryside, in the middle of nowhere in a beautiful, rural landscape. I wouldn’t describe my music as pastoral, but I do think that setting gave me plenty of space to be creative. Later on, it also heightened my reaction to living in London and New York City, both of which had significant influence on my work. On July 28th, your collection “Nobody’s Girl” will be released. Can you talk about what it was like putting this album together? What was it like looking back at the music you made 20-25 years ago and selecting the songs from your self-titled and “Sense and Sensuality” albums? NH: It’s amazing how music can help you travel back in time. The process was exciting, emotional and at times, difficult. In many ways it’s easier to create something new than to go back, undo and redo. I did the remixes with Derek Nakamoto who had co-produced my first record with me twenty-five years earlier. On some days in the studio together it felt as if no time had passed at all. I am a big fan of your version of “I Just Don’t Know What To Do With Myself” from the My Best Friend’s Wedding soundtrack. I understand that it was the last thing that you recorded as a singer. What did that feel like for you at the time? NH: I was completely thrilled when Glen Brunman at Sony asked me to record a Bacharach/David song for the soundtrack. He told me to choose one of three songs, and I couldn’t believe my luck when I Just Don’t Know was one of them. I’m a big Dusty Springfield fan, so her version of the song immediately came to mind. I had recently had the good fortune of writing with the legendary Hal David himself, alongside Franne Golde, and I adored him. This song couldn’t have been a more perfect fit, and producers Jimmy Bralower and Jeff Bova made the recording process a really enjoyable journey I will always remember. What songs didn’t make this collection but you wish could have been included? NH: I think I was able to include everything that I wanted to in this collection. We recently remastered my first and second albums and so they will both be available digitally at the same time as Nobody’s Girl. You have written for so many incredible acts like Tears For Fears, Cyndi Lauper, David Byrne and more. Can you recall a particularly special working relationship that you had? What writing moments really stand out to you the most year after year? NH: I spent a good year and a half working exclusively with Roland Orzabal from Tears For Fears. We started writing during sound checks on the Songs From The Big Chair World Tour in 1985, and continued working together throughout 1986 in my apartment in Broadhurst Gardens, London. It was amazing to have the opportunity to write a body of work with one person, especially someone as brilliant as Roland. I learned a lot from him and am very proud of our songs. NH: I have noticed over the years that I know a song-writing collaboration is going well when my dog walks into the room, jumps up on the chair and lies on his back with his legs in the air. He always makes an entrance on a successful co-write! NH: Carole King, Steely Dan, Tom Waits, Randy Newman and Claude Debussy are some of my favorite artists who have continued to inspire me and my music. I would love to work with Donald Fagen in the future… and John Mayer… and the incredible Adele! NH: I think of songs as little beacons of light that you put out there. Sometimes they connect with someone somewhere, and sometimes they don’t. I love it when people can identify with the sentiments of my songs, interpreting the lyrics to make them their own. NH: Don’t let other people make the rules for you. Make your own rules. NH: Sometimes you have to go backwards in order to go forwards. Putting together Nobody’s Girl has been a gateway to both the past and the future for me. An Interview With Taiwanese Classical Jazz Artist, AMANDU WU!